Microelecrtomechanical systems (MEMS) are not very big devices which are joined with semiconductor devices and which combine characteristics of circuits and mechanical components. Different types of MEMS demand parameters control in terms of various physical, temperature effects and other conditions that define functionality of equipment. Usually to achieve reliable and accurate equipment inspection there are required careful choice, design and each subsystem component’s integration including measuring equipment, device for mechanical effect, testing adaptor, equipment for temperature modes alignment and software as well. 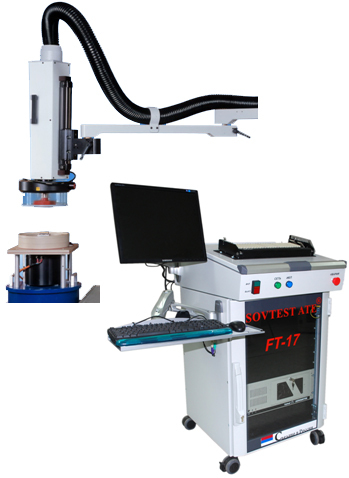 Using its own development Measuring complex for functional control FT-17 as test equipment, Sovtest ATE, Ltd develops and supplies ready-made MEMS testing solutions both for short-series manufacturing (semi-automated) and full-automated systems for inspection of large production. equipment for alignment physical effects on tested object. Testing adaptor is installed on the equipment for alignment physical effects and with the help of cable set is connected with measuring system. 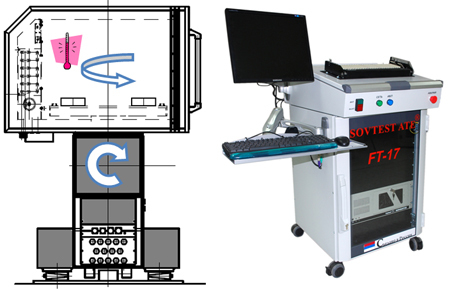 All the system components are connected by one program environment which task is to control test process, to align conditions, to measure output signals, to collect statistics, etc. The equipment for alignment of physical effects can be both stands for imitation of a single effect and complicated multi-component stands as well. Used to control accelerometers MEMS parameters at manufacturing and input control. MEMS dynamical characteristics (pass band). temperature changing speed - from 55°С to +125°С - 5 sec. simultaneous measurements – max. 64 channels. It is included in State register measuring equipment (certificate for measuring equipment of military purposes type confirmation). II.Testing of gyroscope and angle transmitter MEMS parameters. The equipment is used to control MEMS parameters of gyroscopes, angle transmitters, tilt sensors and angular speed at manufacturing and input control. It can be used for calibrating MEMS accelerometers. temperature measuring speed - 4 °/sec.